It's been so long since I last did any screen printing I started worrying I wouldn't remember how to do it anymore :(. Thankfully though once I set up my work area and pulled my first print I was happily surprised to see how quickly it all came back to me. Yay! I used my Mushroom print on Essex linen to make a pillow cover and I absolutely love the way this pillow looks in our living room. I used Erin Dollar's (cotton and flax) print for the backing and added and invisible zipper for a clean, polished finish. Do you work with invisible zippers? I used to be quite intimidated by them but then I found fabulous tutorials by Rachel (stitched in color) and Katie (Sew Katie Did) and they both explain the process so well that an invisible zipper is my go to way of finishing pillows most of the time now. And, while I was at it, I printed a few panels for my stash. I'm so happy with how all these prints came out and can't wait to turn them into fun, useful projects soon. How about you? Any handmade gifts still on your list? are you doing any Christmas sewing this year? I want to make tons of presents for family and friends but as far as decorations go I decided to use mostly what we already have (since we do have plenty), and focus on just a few small projects to add a bit more Christmas spirit throughout our home. I made these Grinch pillow covers for my kids and I just love how cheery they turned out. Funny, I'm using Grinch and cheery in one sentence :). I purchased this lovely fabric last year at Joann's thinking it would make a great backing for a new Christmas quilt, but I don't really see myself making one any time soon so I decided to just cut into the fabric and put to use. You can find a free tutorial for the bunting here. And, if by some miracle, I still have time to spare I'm thinking of re-visiting Amanda Jean's (crazy mom quilts) fabulous Trees! and Mini Trees! patterns. Hello lovelies, happy Sunday to you all! I've been playing around with some simple pouch ideas lately as I looked for just the right pencil case to keep in my purse and I'm happy to say this Slim Pencil Case is what I came up with. 1. Adhere fusible fleece to wrong side of both exterior panels. Use hot iron and lots of steam, make sure to press through the exterior fabric and not directly onto the fleece. 2. Fold ribbon in half, pin it about 3/4'' down from top edge along left side of one exterior panel. Use 1/8'' SA to stitch it in place. 3. Bend zipper tape on both ends of zipper at 45 degree angle towards wrong side of zipper tape. Baste within seam allowance either by hand or by machine to secure in place. 4. Center zipper right side down along the top raw edge of exterior panel with basted ribbon (zipper pull will be on left side). Align zipper tape with panel's top raw edge, clip or pin to prevent layers from shifting and use 1/8'' SA to baste zipper to exterior panel. 5. Now place lining panel right side down along exterior panel's top edge (zipper is sandwiched in between lining and exterior panels). Clip or pin to hold layers together, add zipper foot to your sewing machine and use scant 1/4'' SA to stitch along the pinned/clipped edge taking the pins/clips out as you sew. Press the panels away from zipper. 6. Attach second exterior panel and lining to second zipper tape following the same directions. 7. Attach regular presser foot to your sewing machine and use 1/8'' SA to topstitch along exterior panel ONLY as shown in photo below. Repeat for second exterior panel. Use hot iron and lots of steam to press lining panels away from zipper. 8. Open zipper about half way, align exterior panels on top of each other and linings on top of each other as well, pin or clip to prevent layers from shifting. Sew all the way around the edges making sure to leave about 3'' opening in the lining's bottom edge for turning. Use fabric scissors to trim corners, press the seams open. 9. Turn the pouch right side out through the opening in the lining. Use your fingers to make bottom corners nice and pointy and push out the zipper. Stitch the lining closed. Push the lining gently into the pouch, give it one final press, remove all the stray threads, and add a leather zipper pull if you wish. All finished. Pretty easy, isn't it? I hope you give this cutie a try. 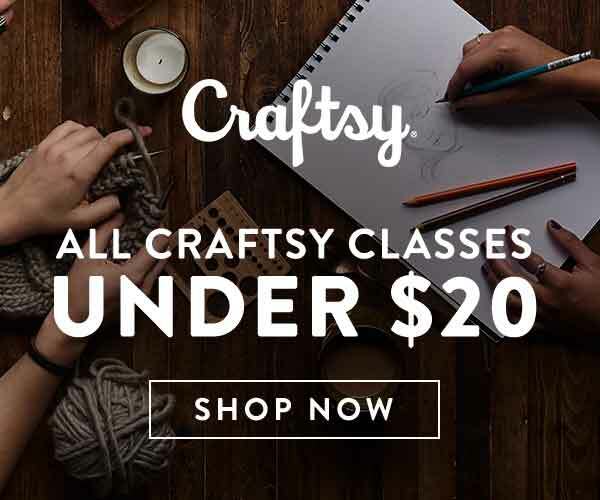 I just wanted to pop in real quick to let you know that now through Nov. 11th you can purchase all Craftsy classes (including my Giftable Projects class) for $20 or less. Exciting, isn't it? Just click on the banner below to be taken to Craftsy website. Disclaimer - I am a member of Craftsy Affiliate Program and will receive a small portion of sales through this site. 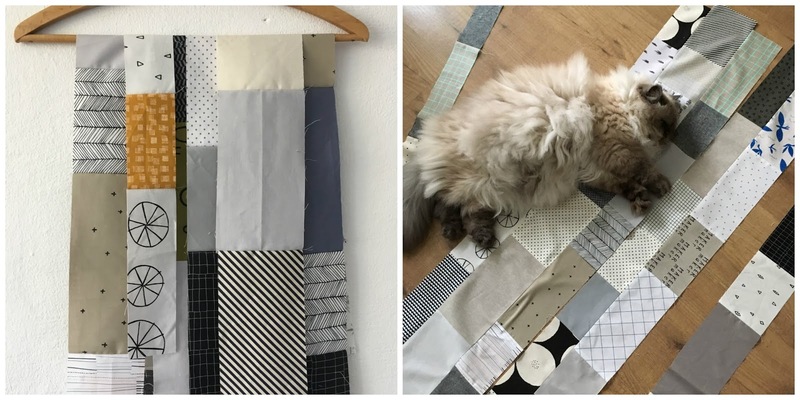 I love working with my fabric scraps and recently I've been feeling it was time I turned some of my beloved scraps into a quilt. I sort of knew what color palette I was going for, but I had a very hard time deciding on a pattern. I wanted something simple, not too time consuming for either cutting or piecing, preferably something improv so I could add and subtract fabric pieces as I went. I know, right? Easier said than done. And then I came across this quilt by Suzuko Koseki in her fantastic book Patchwork Style and I knew this was the way to go. I loved the idea of different widths and lengths of fabric combined into one cohesive look. I think scraps are really great for quilts like this since you can let the scrap size dictate the size of the block and thus very little fabric gets wasted. I randomly pieced the scraps together and once I had enough rows pieced I spread them out on the floor to see the final layout. Of course Lola was no help. This happened pretty much every time any fabric got placed on the floor, grrr! This is going to be quite a large quilt (for me anyway), it's about 70'' x 90''. You know what I'm mostly excited about? Hand quilting this beast! ... or I sometimes just plop myself on the couch with the quilt in my lap and get stitching. What have you been working on lately? Any long term projects? I 've been meaning to make myself a bag using Cotton and Steel Monstera canvas for quite some time but every time I tried cutting into it I totally got stuck. I just couldn't commit to any one pattern :(. I think the reason for my "stuckness" was that as much as I love this print, deep down I knew it would be a bit too much for me if I were to make a bag using just this one fabric alone. And then Aly (@mudandthread on IG) used this print together with a solid fabric to make her Melinda Tote Bag and I suddenly realized that's exactly what I should do too. I rummaged through my stash and decided to combine the Monstera print with the most fabulous Merchant and Mills Oilskin I purchased a while back. I love this fabric. It's water resistant, sews beautifully, and adds a wonderfully polished look to a finished project. I used my Vera Slouch Bag pattern and I'm super, super happy with how it turned out. And, it was such a quick make, too. Every time I make this bag I'm surprised at how quickly it all comes together. This time though instead of my usual magnetic snap closure (what the pattern calls for) I added a zipper to my bag. It was a bit more work, but totally worth is as the rainy season is here and I felt this way my stuff will be a bit more protected. You can purchase the pattern here in case you'd like to make a Vera of your own. Hello lovelies, how are things? 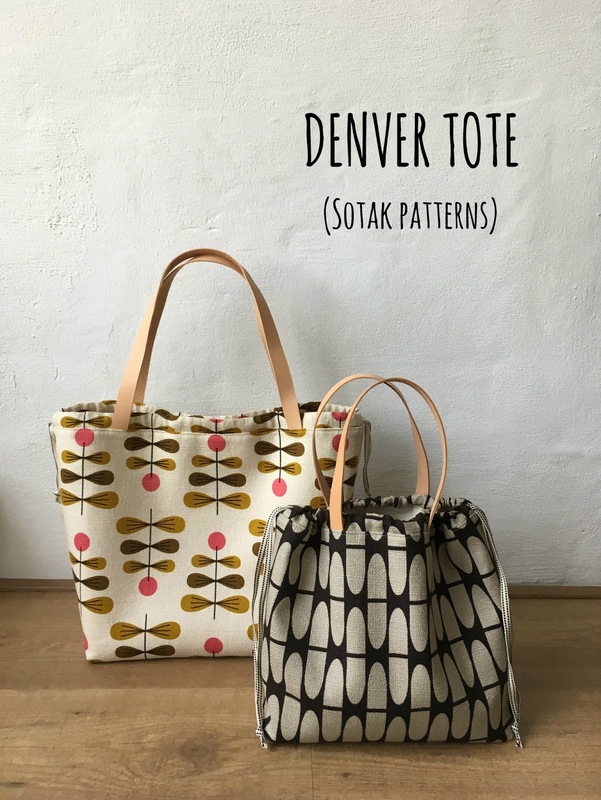 I'm all giddy with excitement because I get to share my newest pattern with you today, yay! Finished size: 12'' wide x 11'' tall x 5'' deep. She's a fabulously roomy everyday handbag featuring two large slip pockets on the outside plus one slip and one zipper pocket on the inside to help one stay organized. I made this denim Melinda for myself a few weeks back and I absolutely love it. I think it's such a classy, timeless design and I just adore the denim, leather, and metal hardware combination. You don't have to use leather or rivets for your bag though. The pattern includes instructions on how to make your own fabric handles if that's what you prefer, and rivets are completely optional. I designed this bag with slightly heavier fabrics in mind. 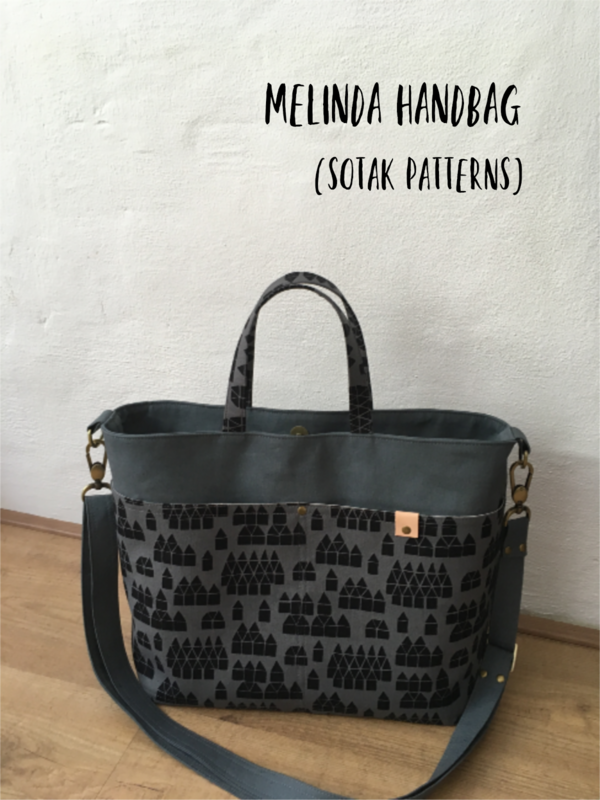 Denim, Essex linen, or any of the beautiful designer print canvases would be absolutely perfect for this bag. You could, of course, use quilting cotton as well, you'll just need to add a bit more interfacing for stability (I talk about it a bit in my pattern). You can now purchase the pattern at my Etsy shop here, and for the next 48 hours (now through Wed, Oct. 24th) you can purchase this pattern at a 25% off introductory price. No coupons needed, the price is automatically adjusted to reflect a 25% discount. I'm a firm believer in working hard and doing one's best but also in slowing down, taking things easy, relaxing, and doing things just for fun. I also think it's very, very important to try and learn new things. I've wanted to explore weaving for quite some time and this past week I finally made it a priority. Oh, it was fun! It feels great to be a beginner. You know, when you still don't know how things "should" be done so you dare to do it your way, when it's totally ok to make mistakes (it actually is always ok to make mistakes, we just put too much pressure on ourselves). I pulled out my loom (purchased from here a while ago) and a supply of random yarn, watched a Weaving for Beginners class on Creativebug, and got to work. I decided to go with very simple stripe pattern using different thicknesses of yarn (inspired by @blanc_laine's beautiful work) and I just love, love, love how it all came together. I added a long fringe to the bottom and used a 12'' wooden dowel and leather string for hanging. I think it looks absolutely adorable and I'll be definitely exploring weaving more in the future. How about you? Have you tried something new recently? Or are planning to? I really, really enjoy sewing up projects for our home so when I realized we needed new potholders I was more than happy to drop everything and get stitching. I started off with some of my screen printed scraps and a few pieces of Essex linen (my favorite combo), and randomly pieced them together until my patchwork measured about 7.5'' x 8.5''. This measurement wasn't really important as potholders could definitely be smaller or larger depending on one's preference. I then quilted my patchwork piece to a layer of Insul-Bright to ensure I could use the finished potholder to handle hot things. I then trimmed and squared my quilted piece to measure 7'' x 8'' and I did basting stitches all the way around the panel's perimeter to ensure quilting stays in place. I also basted a slightly larger piece of fabric to cotton batting and quilted it as well. I then placed quilted front and back wrong sides together, pinned, basted, and trimmed off extra backing + batting. A little note on quilting: as you've noticed I quilted the top and bottom part of the potholder separately. The reason for that was I was using my backup machine with no walking foot and two layers was all I was confident to stitch over without worrying about puckers. You could, of course, layer all four panels on top of each other (backing right side down, cotton batting, Insul-Bright, and patchwork panel right side up on the very top) and quilt through it all at once. All I needed to do then is add the binding the same way I would add it to a quilt. I first machine stitched the binding to the front and then used running stitch to attach it to the back. And then I added a leather strip + rivet to make a hanging loop. Easy peasy! What do you think? Pretty fun and quick to make, isn't it? I'm sure I'll be making more of these pretty soon.